Today we have released the third pattern in our Parkland Collection! 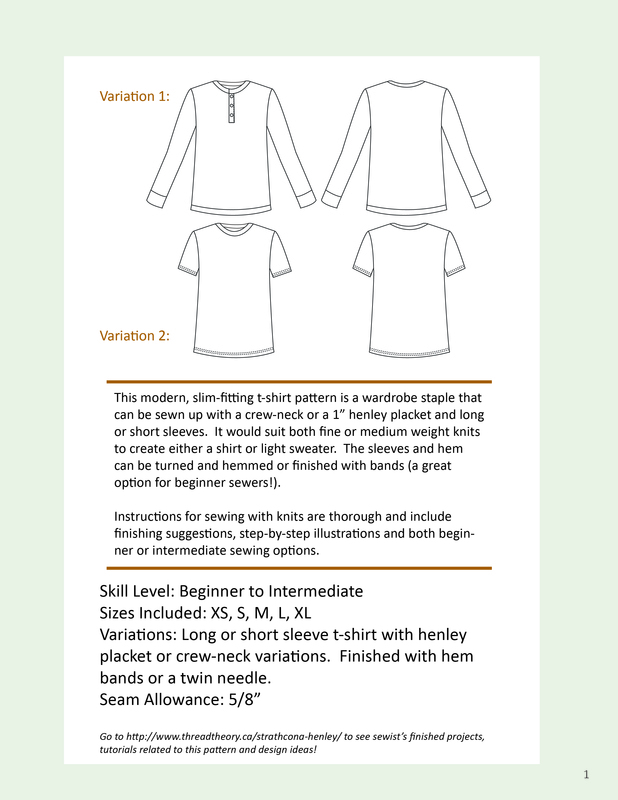 Head on over to our pattern store to download your copy of the Strathcona Henley and T-shirt sewing pattern. Yes, I said henley and t-shirt pattern! We decided to make the pattern more versatile so that it will become your go-to pattern every time you need to refresh the closet with staple tees. 1. The long sleeved henley-style knit shirt with a three button placket, cozy cuffs and an easy-to-sew hem band. 2. The short sleeved classic crew-neck t-shirt with short sleeves and a twin needle (or zig-zagged) hem. Go ahead and mix and match these variations to create endless t-shirts! I can wait to see all the short sleeved henleys, the super easy and quick crew neck longsleeve t-shirts, and the awesome t-shirts with contrast hems and neck bands! Really, the possibilities are endless! My version of Variation 1 made in a relaxed rib knit: The warm, slightly rusty colour and the loose, relaxed fit created by the very stretchy ribbed fabric make this version the perfect top to wear while sitting around an early fall campfire! Blogless Anna’s version of Variation 1 using an awesome striped jersey paired with a bold black contrasting placket (see her great blog post for all the details of her sewing process): This version of the henley looks so classic and RTW! I imagine it would be awfully difficult to grab any other shirt when this is sitting in your closet! Anna of Blogless Anna’s striped henley with contrast black jersey placket. It looks positively RTW! My mix of Variation 1 and 2 to create a sporty hiking and mountain biking top for my dad: I made things easy on myself by using snaps instead of buttons and by cutting off the bottom of the sleeves to use this fabric as small sleeve bands – no twin needle needed! My dad in his Size Large sample sewn in a wicking sportswear knit with a green contrasting placket, a patch pocket, and short sleeves (with bands). Do you like what you see? Head on over to download the pattern and you can whip up one for yourself or a lucky recipient in no time at all! The crew-neck version, when paired with sleeve and hem bands is the perfect beginner knit sewing project and the henley placket variation is a great challenge for more intermediate sewers. If you are scared of sewing knits, you don’t need to be anymore! The instructions include suggestions for setting up your sewing machine (even if you don’t have a serger!) to correctly deal with the fabric you chose. They also include different tips and tricks for beginner or intermediate sewers. Both variations are quick to make and result in a casual, slim-fitting t-shirt that will be a perfect hand-made wardrobe staple. Happy sewing! Categories: Morgan's Sewing Projects, Showcase, Strathcona Henley | Tags: pattern launch, Pattern Testing, t-shirt | Permalink. I agree 🙂 Especially since it’s such a quick project! congrats on the pattern launch, i’ll be picking this up soon! love that you included a basic tee as well–i know i’ll get lots of use out of it! Thanks for your comment! Good luck sewing your version! I will be making many more- one which is a direct copy of yours Blogless Anna! A fab t-shirt, with loads of versatility, quick to make and a great fit. Thank you Morgan and Matt! I just read your henley post Layla and I had a good laugh (laughing with you, not at you!). My tip, which I of course forgot to share in my blog post, but I did remember to tell Morgan and Matt, is to hand tack the bottom of the placket in place before going anywhere near it with a machine! Can’t wait to see your copycat version… copying is of course the highest form of flattery! No problem! Your blog post is great! I agree with Anna, handstitching at least part of the placket before any top-stitching is the way to go – it totally eliminates the frustration of knit shifting and wiggling as you sew. This is great! I will definitely be picking up this pattern! Congrats on the launch! Hope it goes well. I just purchased the pattern and am looking forward to finding the right fabric to try it out. You all are speeding right along with all your pattern releases! Good luck! Hurray! I’ve been checking the site each day and waiting for this to become available. Off to get my copy now. Can’t wait to try it out! Awesome! Thanks for buying it…now good luck sewing! Congratulations on the launch of a fabulous pattern. Loving all the variations now on offer. Mr Blogless Anna wore his henley on the weekend and my sister-in-law has already placed an order for her husband. Fantastic! My attempt to draft/rub a pattern off my husbands fave tshirt was a bit of a disaster so I’m thrilled with this! And today I finally get time to catch up with the shorts sew along…..
I’m glad we can spare you any more work and I hope that the Strathcona turns out even better than his favorite t! How exciting! I plan to snap this up next time K needs a new t! Great! I look forward to your versions! Can’t wait to make a ton of these! Yay 🙂 Can’t wait to see them!